The Hispanic Association of Colleges and Universities has announced 18 students have been selected for its first Leader-in-Residence Program. 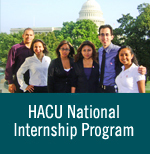 The students selected are from HACU-member institutions and recently participated in the ¡Adelante! Leadership Institute, which is the student track of HACU’s Annual Conference, held on Oct. 6-8, 2018, in Atlanta, Georgia. As part of the program, students serve as a resource on their campus and provide information about HACU internships, scholarships, and advocacy efforts. They will work with a mentor from their home institution to help guide them on campus outreach efforts. Leonardo Caballero, College of Staten Island, N.Y.